I have no influence on the Websites and the contents of these websites which are linked on the www.mistelsymposium.de. I declare that I don't take any responsibilty or liability for the contents of any linked page. I dissociate from all linked pages. This declaration is valid for all links on the www.mistelsymposium.de. 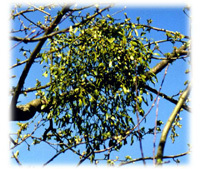 Mistletoe symposia have been held regularly every 4 years since 1995, since 1999 in Nonnweiler (Saarland) in the local European Academy Otzenhausen (EAO), Europahausstr. 35, D-66620 Nonnweiler (www.eao-otzenhausen.de ). The next, the 7th Mistletoe Symposium, is scheduled for November 7-9, 2019. Mistletoe symposia should create a discussion forum for physicians and scientists to exchange different points of view. Intended is an interdisciplinary dialogue across the boundaries of therapeutic directions. For this purpose, lectures and posters will be presented and discussed at the event, the abstracts of which are published in advance in a supplemental volume of the journal Phytomedicine from the Elsevier publishing house in English and are permanently freely available on the Internet at www.ScienceDirect.com (examples of the Mistletoe Symposia 4, 5 and 6 see the corresponding section on this symposium homepage). After the symposium, these lectures and posters will be published in full text in a book published by KVC Verlag, Natur und Medizin e.V., Essen (www.kvc-verlag.de ), both in printed and electronic form. The mistletoe symposia will be conducted by a collegium of scientific societies jointly organizing the respective symposium under the direction of Dr. Rainer Scheer, Carl Gustav Carus-Institute, Niefern-Öschelbronn, and Prof. Dr. med. Harald Matthes, Gemeinschaftskrankenhaus Havelhöhe, Berlin, prepared and carried out. Dr. Scheer is also responsible for this website under the umbrella of the Gesellschaft zur Förderung der Krebstherapie (Society for the Promotion of Cancer Therapy) e.V. (see Imprint). The Gesellschaft zur Förderung der Krebstherapie e.V., sponsoring association of the Carl Gustav Carus-Institute, takes the protection of your data, which you have entrusted to us, very seriously. These are so-called "personal data", which are a valuable asset. As a non-profit organization, we always treat your data confidentially and adhere to existing data protection laws. We want you to know how we collect your information, what information we store, why we do that, for what purpose we need it, and when we delete it. Furthermore, we would like to inform you about your rights regarding your data with us. This statement is intended to explain to you to a sufficient extent the data protection measures of the Gesellschaft zur Förderung der Krebstherapie e.V. with regard to the Mistletoe Symposium (www.mistelsymposium.de ). How do we collect your data? Which data are collected, processed, stored and linked by us? When will they be deleted? We only collect personal data directly from you. To publish the abstracts in Phytomedicine (Elsevier-Verlag) and the full text in the book at the KVC-Verlag, we collect the following personal data from all authors: first name, name, institution / company, city, country, as well as the corresponding author telephone and FAX Number, as well as e-mail address. For the full texts of the book, the titles of the authors are requested addionally, and but no telephone or fax number will be published (see under the heading "Publication of the articles" on this symposium homepage). When registering for the symposium, we request the following personal data from each participant (including lecturers / speakers): title, first name, surname, institution / company, address with street and house number, postal code, place of residence and country, as well as further contact details such as telephone number, FAX and e-mail address. As the mistletoe symposia are multi-day events, you can stay in the conference center and can be provided there, if you wish, we ask - as a service for the conference center - on an appropriate form additionally duration of stay, accommodation, and type of food (vegan, vegetarian, Meat-containing food) and when and at what meals you want to participate. All of this data is kept in paper form as well as electronically, e.g. in tabular form. After completing all the work on a mistletoe symposium (event, abstract volume, book), your personal data will be needed for further communication, to prepare for the next mistletoe symposium, for example for invitations or requests for contributions. Your data will be deleted if you wish so (see chapter "Information about your rights regarding your data with us"). The legal basis for these data collections is described in the General Data Protection Regulation (GDPR) in Article 6 paragraph 1, more precisely in paragraphs a (consent), b (binding participation in the symposium as a kind of contractual relationship) and in paragraph f (to safeguard and achieve the Objectives of the symposium, see the introductory chapter of this statement as well as the chapter "Objectives" of this website). For what purpose do we need this data? and for correspondence in the context of the publication of the abstract volume and the book. When communicating by e-mail, we must point out to you as a precautionary measure that this should primarily facilitate communication with each other, but that this type of communication can also have security gaps. A complete protection of e-mail traffic from access by third parties is not possible. What is published on the website www.mistelsymposium.de ? any joint public statements made during the symposium. We ask you to keep your data up-to-date with us, so inform us in good time and in writing about these changes (e.g. address, telephone and e-mail connection). The information changed or deleted in this way will not be retained by us. Who receives knowledge of your data and to whom are they forwarded? All of your data will remain in the business area of the Gesellschaft zur Förderung der Krebstherapie e.V. All personal data required for publication in the abstract volume will be forwarded to Phytomedicine at Elsevier-Verlag, as well as for publication in the book to KVC-Verlag, in each case to authorized employees of the respective publisher. A list of participants will be created for use in the symposium itself. This list of participants contains the personal data released by the participants, but always the title, first name and name of the participant. Each participant in the Mistletoe Symposium receives an abstract volume and the current printout of the list of participants at the beginning of his participation in the symposium. This list of participants will not be posted on the homepage of the Mistletoe Symposium or otherwise published. The organizers will ensure that participants in the mistletoe symposia receive continuing education credits from the respective chamber. For each mistletoe symposium, the granting of continuing education credits is applied for both at the Landesapothekerkammer des Saarlandes and at the Landesärztekammer des Saarlandes. For this purpose it may be necessary - in accordance with the specifications of the two chambers - that occupational group-specific, daily-precise attendance lists be forwarded to the respective chamber. In addition, there will be no disclosure, especially not to unauthorized third parties. How are your data managed by us? Not all employees of the Gesellschaft zur Förderung der Krebstherapie e.V. have access to your data, but only those in whose area of responsibility the measures described above fall. All persons dealing with their data are regularly obliged in writing in addition to their general labor law obligation to secrecy over trade secrets to the data secrecy and in terms of the rules for a good data protection practice (GDPR and BDSG new) in detail. Your data is secured against loss and unauthorized access. What happens when you visit our website www.mistelsymposium.de ? If you visit the web pages of the above mentioned site, the server does not create log files. We asked our internet service provider to disable this feature. In the event of an error, the log function is activated manually and log files are created, but they do not contain data that can be assigned to persons or systems (such as IP address, login name). The resulting data will be deleted immediately after correcting the error. The Gesellschaft zur Förderung der Krebstherapie e.V, does not need any information stored in the log files of the website www.mistelsymposium.de . Cookies for identification are not used. We want you to know about your rights to your data with us. Each data subject has the rights listed below by the legislator if personal data has been transmitted to us by you. Since the current data protection law encompasses far more applications and purposes for the handling of personal data than we need for the purposes stated in this declaration, this does not represent the complete data protection law, but only your rights in relation to what we do with your personal data. According to Art. 15 GDPR you will receive upon request free of charge a confirmation as to whether personal data relating to you are being processed. If this is the case, you also have the right to request information from us about the data stored about you, its processing purposes, its categorization, its recipients and the planned storage period. The information or confirmation can also be issued electronically at your request. According to Art. 16 GDPR you have the right to immediately request the correction or completion of incorrect personal data concerning you. For example, if the purpose for which your personal information for which it was collected is no longer necessary, or you have revoked your consent, you have according to Art. 17 GDPR the right to demand that your personal data be deleted in this regard and without delay. However, if you continue to participate in the symposium, only the title, first name and name will appear on the participant list. Contact data for further communication with you, can inevitably, if you continue to participate in the symposium, not be deleted. You have the right to object to the use of your voluntarily given data for the future. You can do that in writing at any time and without justification. This may be the case, for example, if, contrary to your original commitment, you no longer wish to attend the symposium. There are no disadvantages for you. However, this does not affect all obligations that you have entered into with third parties (conference center, publishers, etc.). According to Art. 19 GDPR, any rectification of your data, any deletion, any communication to the above-mentioned recipients (conference center, publishers) will also be communicated to you. According to Art. 13 (2) (d), you have the right to complain about our data protection practice with this authority. The Gesellschaft zur Förderung der Krebstherapie e.V. regularly maintains this website in order to keep it up-to-date and correct. Nevertheless, no guarantee can be given for the permanent accuracy of the information provided. This website of the Gesellschaft zur Förderung der Krebstherapie e.V. contains links to other websites. We have no influence on the content of these pages and therefore assumes no liability for their content; we dissociate ourselves from possible infringements of foreign sites, which are referred to. ... are very welcome! Please no fears! It is also through this contact with you that we want to self-critically review the protection and security of your very personal information that you have entrusted to us and, if necessary and possible, continually improve it. That is very important to us. Responsible for Data Protection of the Gesellschaft zur Förderung der Krebstherapie e.V.